As befits one of the largest weapons manufacturers in the known world, Kaalakiota's ships are very combat focused. Favoring the traditional Caldari combat strategy, they are designed around a substantial number of weapons systems, especially missile launchers. However, they have rather weak armor and structure, relying more on shields for protection. 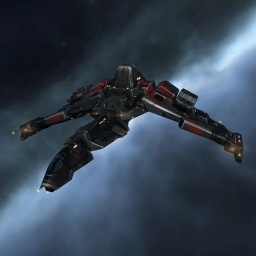 The Crow is the Caldari fleet interceptor, repurposed from the combat interceptor role in Rubicon 1.0, and as such has a bonus to warp disruptor and scrambler range, as well as the MWD signature radius bonus and bubble immunity common to all interceptors. Oceanus 1.0 removed a low slot and added a high slot and a launcher hardpoint, as well as switching its kinetic damage bonus for a explosion radius bonus. , allowing it to fit both Point and Scram. Further information about additional or recommended skills to pilot Crow for a specific or it's common role(s) can be written here. Literally the worse ship (interceptor). Slow, bad fitting room, but on the upside it's least a tiny bit tankier than other inties (tiny amount). No sub-article about Crow roles or piloting tactics. You can write them here. You can write additional notes for Crow here. This page was last modified on 10 September 2017, at 15:32. This page has been accessed 119,653 times.